You wouldn’t know this, but I’ve sat here at work staring at my computer for nearly an hour. Don’t get me wrong, I am a hard worker it’s just that today is the first day we are hitting 80 degree weather this year here in Boston and I would so much rather be out there enjoying the weather. If you live here and went through the winter we just went through, then you’d definitely understand. The upside about being inside, I get to post about whisky and I certainly won’t complain about that. One of the things I love is a good Islay whisky and Caol Ila is no exception to that. Caol Ila (pronounced col eela) means “Sound” in Gaelic. The Caol Ila distillery actually happens to be the largest producing distillery in Islay today. My first write up about Caol Ila was last year and independent bottlers Gordon and MacPhail produced that Caol Ila whisky. If you didn’t read that post, the link is provided above. 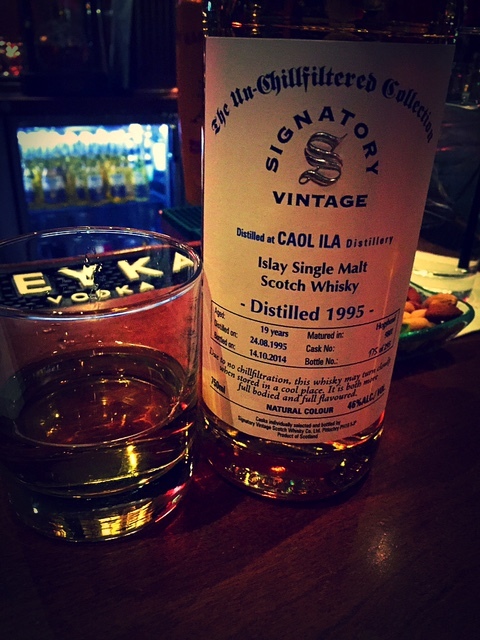 Independent bottlers also produced this Caol Ila, but in this case, Signatory Vintage, which was first founded in 1998 by Andrew and Brian Symington. This bottle is 19 years old. It is matured in Hogshead and is bottle number 175 out of 295. It was distilled on August 24, 1995 and bottles on October 14, 2014. This is a darn tasty whisky and although it is peated, I found the dram to be light and perfectly balanced. It is tasty and absolutely delicious. If you have never tried it, and you are a fan of Ardbeg and Lagavulin, then you will definitely love this whisky. If you don’t enjoy peated/smoky whiskies, this one is definitely not for you.